The calls (Busso, Volo, Stiscio) of the player are very important factors of the Tressette since they allow the couple to exchange some useful informations in steering the game The most important one is certainly the 'Busso' owing to immediate effects that it can give. Obviously they are a limit because they are public declarations and thereore known to opponents. The calls are coupled with songs that resemble the typical sounds of the cards move. This program can offer good satisfaction to enthusiasts of the game and to inexperienced players a very useful tool for learn its beauty. to complete the first hand. 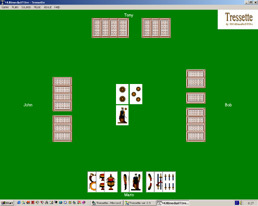 The "Tressette" requires 4 players, in couples. The dealer is the player that deals the cards, 10 cards for each player. For each hand the turn passes to player on the right. The Player on the right of dealer starts the first hand playing a card that fix the prevailing suit. The other players must reply with a same suit card, if they have. If don't, they can play any other one. The highest card of the prevailing suit will win the hand and the player who played it will start the next hand. These cards arrangements give additional score. Volo (i.e. fling). The card is flung on the table to say 'no more same suit cards'. Striscio (i.e. creep) A Player tells he has at least another same suit card beyond that played. The total of points in the pack are 11 + 2/3, but the fractions of points are not considered. The Couple who achieves 21 points will win the game. Generally several steps are necessary to reach 21 points.